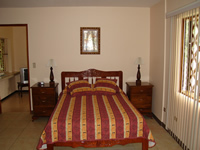 Heredia Hotel - Studio/Hotel rooms, nicely , sleep 2, queen or kingsize bed, cable tv, phones, most with jet tubs. Air conditioning is not necessary because of the cool night breezes. La Catalina hotel in Heredia is the perfect place to come and relax or get into shape in our professionally equipped gym, or take a few laps in one of our two swimming pools. Walk the grounds and enjoy the lush gardens and quaint ponds, or talk to our parrot. The Main House: Sit and enjoy a cocktail beside the fireplace, in the private library & bar. Catch up on that vacation book, relax on the veranda and take in the breath-taking views of the valley below. 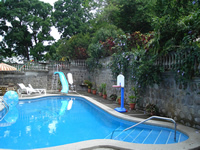 Internet, phones, cable TV, two pools, tennis court, private gym, cigar bar, acres of green gardens, fabulous valley views. 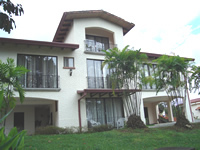 Main Mansion: Studio/Hotel rooms, nicely decorated, sleep 2, queen or kingsize bed, cable tv, phones, most with jet tubs. Air conditioning is not necessary because of the cool night breezes. One-Bedroom Units: Acommodates 4 people, fully equipped kitchen, full bathroom, ceiling fans, cable TV, phones, steps to pool and some with air conditioning. 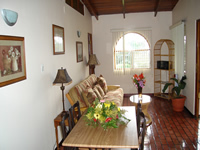 Two-Bedroom Units: Accommodates 6 people, one or two bath, fully equipped kitchen, cable tv, phones, beautifully decorated in the Costa Rica sytle, some with air conditioning. Activities: Poas Volcano: It is one of the most spectacular volcanoes in Costa Rica. Fabulous view of the central valley, featuring the third largest crater in the world. Appx: 30 minutes from La Catalina Resort and 3 hours from the Copacabana in Jaco. Canopy Tours: Costa Rica is mostly covered in rainforest and one of the most loved ways to explore it, is through a canopy tour. It is a great way to see the whole forest without disturbingthe nature and wildlife within it. The tour is experienced through zipping across a zip line between two platforms high in the forest. If zipping is not for you then most tours also feature a hanging bridge walk through the jungle. Definitily one of the most thrilling experiences in Costa Rica.